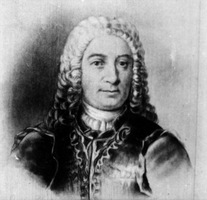 DUBOIS BERTHELOT DE BEAUCOURS, JOSUÉ (Jean-Maurice-Josué), naval officer and officer in the colonial regular troops, chief engineer of Canada, governor of Trois-Rivières and Montreal; b. c. 1662, probably in France, son of Jacques-Hyacinthe Dubois Berthelot and Péronelle de Magnan; d. 9 May 1750 in Montreal. Josué Dubois Berthelot de Beaucours began a career of service to the king at 20 years of age when he enlisted in the French navy. On 15 April 1684 he was appointed to the rank of midshipman at Brest, where he probably studied the techniques of engineer Sébastien Le Prestre de Vauban who had directed the fortification of the port since 1680. Beaucours served in several naval campaigns in these early years, but on 26 June 1687 the king ordered him discharged from the service. The cause of his dismissal is unknown. Did he then volunteer for service in the colonies as atonement for his error, or was he ordered abroad as punishment? Whatever the case, on 1 March 1688 Beaucours was commissioned a lieutenant in the colonial regular troops of Canada, and later that year arrived in the colony. By 1690 guerilla warfare with the Iroquois had reached the point that even Quebec, Trois-Rivières, and Montreal were deemed vulnerable. 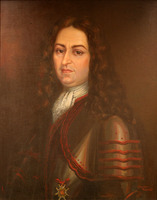 Since engineer Robert de Villeneuve* had returned to France in 1689, Governor Claude de Ramezay* of Trois-Rivières set Beaucours to work on the town’s defences. In 1691 Frontenac [Buade*] visited the town and, impressed with the young officer’s work, promoted him half-pay captain. Early in 1692 Beaucours took over the command of an expedition, originally headed by Claude Guillouet* d’Orvilliers, against the Iroquois to the west. His successful encounter with an Iroquois band on the island of Toniata (near present-day Brockville, Ont. ), was commended by both Frontenac and Champigny [Bochart*], and the following year the king confirmed him in the rank of half-pay captain. 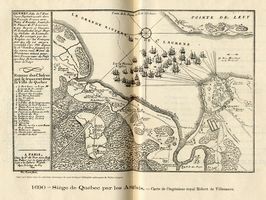 By the fall of 1692 Villeneuve’s successor still had not been chosen and Frontenac, believing an English attack to be imminent, commissioned Beaucours to draw up plans for the fortification of Quebec. Working under pressure, Beaucours laid out new walls that were easier to defend and required fewer soldiers. He designed the Saint-Jean and Saint-Louis gates, the Cap-Diamant redoubt, and the Royal, Dauphine, and Saint-Roch strongholds. That winter Champigny wrote that Beaucours’s work was better and cheaper than Villeneuve’s, and in 1693 Frontenac recommended him for the post of engineer. From April 1693 until July 1694, when he left for France to settle some domestic affairs, Beaucours drew the engineer’s salary of 100 livres per month. Two assistants at 40 livres per month each helped supervise the work of 500 troops in Quebec. Again Frontenac and Champigny praised Beaucours and requested a promotion for him. In 1696 Beaucours was named to command Claude-Sébastien de Villieu*’s company in Acadia and to improve that colony’s defences during Villieu’s detention in Boston, but he never took up this post. He sailed to Canada in 1698 where his presence was required during engineer Jacques Levasseur* de Neré’s absence in France. On 31 May 1701 Beaucours was commissioned captain, and the following year set to work on the forts in the Montreal area. By 1703 he was working in Quebec under Levasseur who had returned to Canada in 1700. Probably irked by this subordination Beaucours sought an opportunity to distinguish himself in the hope of further promotion. In 1704, therefore, he led a party of about 800 men into New England, but the expedition returned to Montreal after a soldier deserted and warned the English. Later that year, however, Beaucours commanded 120 men sent by Governor Rigaud* de Vaudreuil to join Daniel d’Auger* de Subercase in his attack on English settlements in Newfoundland. Beaucours was back in Quebec in October 1705. An attack on Quebec by the English was feared in the summer of 1707, and Beaucours, acting as chief engineer in Levasseur’s absence, was instructed to set up an alarm system of fires from Bic to Quebec, and to complete the town’s defence works as quickly as possible. 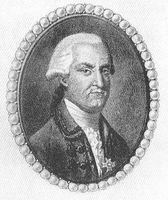 Although only Acadia was attacked [see John March*], Beaucours’s diligence and efficiency were such that Vaudreuil and Jacques Raudot* recommended him, without success, for the cross of the order of Saint-Louis. Between 1707 and 1709 Beaucours worked in Montreal and Quebec. He strengthened the Montreal ramparts, and designed a new prison and court house on Rue Notre-Dame. In the past land had been granted and houses built in such a haphazard fashion that planning had become a necessity in both towns, and Beaucours worked on the alignment of roads. In Quebec he improved the walls and restored parts of the redoubts. Then in 1709 Levasseur, who had begun work on a stone fort at Chambly, returned to France leaving Beaucours to direct its construction. On 25 Oct. 1710 Beaucours submitted a proposal for the fortifications of Quebec, complete with a detailed estimate. This proposal was less expensive and grandiose than Levasseur’s and was accepted. Undoubtedly pleased by this decision, Beaucours returned to Chambly to supervise the fort’s construction, which was finished by September 1711. 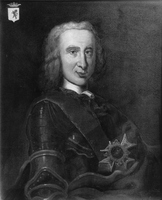 During this year, however, new rumours of a British attack brought Beaucours back to Quebec [see Sir Hovenden Walker*]. Under his direction, the defence of the capital improved daily, and the Beauport shore was made safe from landing parties. Beaucours’s ability to convince the habitants to work contentedly and in excess of the corvée was stressed in a letter written by Vaudreuil and Raudot in which they again requested the cross of Saint-Louis for him. Not everyone in Quebec was impressed with Beaucours’s work, however. The religious orders which held most of the land in the upper town tried to protect their privacy by imposing restrictions on buildings when they sold land bordering on their property. The Ursulines complained that Beaucours had built a high terrace close to their house for the sole purpose of annoying them. Despite such complaints, the following year Beaucours was awarded the cross of Saint-Louis and appointed chief engineer of Canada. He was to direct two deputy engineers: Gédéon de Catalogne* in Montreal and ensign Claude-Dorothée Laguer de Morville in Quebec. After 24 years’ work in the colony, during which time he had drawn plans and directed fortifications for Quebec, Trois-Rivières, Montreal, and Chambly, 50-year-old Beaucours had received the formal recognition he had earned. On 1 July 1713 Beaucours was sent instructions to rebuild in Quebec on its original location the intendant’s palace, which had burned [see Michel Bégon]. The palace was to contain the intendant’s lodgings, the king’s stores, the armoury, the chambers of the Conseil Supérieur and the provost court, a chapel, and a prison. The finished product, which stood three storeys high, was a finer looking and more comfortable structure than the residences of the governor and the bishop. 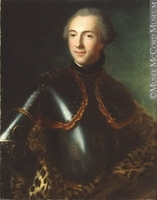 On 10 March 1715 Beaucours was appointed engineer to the new French colony on Île Royale (Cape Breton Island), with the title of second king’s lieutenant [see Philippe Pastour* de Costebelle]. 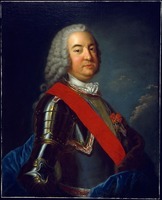 The following year Jean-François de Verville* was named director of Île Royale fortifications, and Beaucours was transferred from Port-Dauphin (Englishtown, N.S. ), where he had originally been sent, to Port-Toulouse (St Peters) with instructions to build adequate defences and to encourage the Acadians to settle there. On 13 June 1716 he received orders to command Île Royale in the absence of the governor; in February 1717 he was moved back to Port-Dauphin. Eight months later he was named king’s lieutenant of Île Royale. On 3 Feb. 1722 Beaucours was appointed to succeed Robert-David Gotteville* de Belile as commandant of Île Saint-Jean (Prince Edward Island) for a two-year period. He was expected to use his engineering talents to put the colony’s three settlements in a state of defensive readiness, and to encourage Acadians to settle there with the island’s 300 residents. However, the next year Beaucours was returned to his previous post on Île Royale. In 1724 it was decided that a resident chief engineer should be appointed for Île Royale, but although governor Saint-Ovide [Monbeton] recommended Beaucours, the position was awarded to Étienne Verrier of the engineers’ corps. 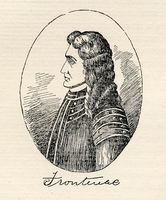 The next year Beaucours learned that he had been refused the governorship of Montreal, and the following year the governorship of Trois-Rivières. But on 16 Jan. 1730, after a 15-year absence from Canada, he was at last appointed governor of Trois-Rivières. This appointment must have led Beaucours to reflect on his long life of public service. It was in Trois-Rivières that he had begun his career in Canada; now, 40 years later, he returned to the town as its senior official. During his brief governorship his chief contribution to the town was several fire prevention regulations. Amongst these was an order forbidding the covering of houses with straw and requiring all chimneys built of mud and interlaced branches to be dismantled. 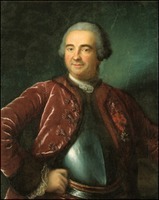 On 1 April 1733 Beaucours was appointed to replace Jean Bouillet* de La Chassaigne as governor of Montreal. As might be expected, his prime interest was the physical lay-out of the town. By 1738 Gaspard-Joseph Chaussegros de Léry had completed the wall, with eight large gates for carts and other vehicles and eight small gates for the townsfolk. The river side of Montreal had five large and five small gates because it was from the river that much of the traffic came, and the settlers needed easy access to the water as fires were frequent in the town. In 1743 Beaucours decided that the daily opening and closing of 16 gates was not only a nuisance but a hazard if the town were attacked, and he considered walling-in some of the gates. Shortly after he took up his post in Montreal a problem arose concerning a property in Louisbourg which he had sold in 1730 for 15,000 livres to Sister Marguerite Roy de la Conception of the Congregation of Notre-Dame. By 1734 Sister de la Conception had been discredited and recalled and the order was unable to make the annual 1,000 livres payment to which she had agreed, even though the purchase price had been reduced to 10,000 livres. A further debt of 5,000 livres to Beaucours which Sister de la Conception had contracted in 1733 was repudiated altogether. On 15 Feb. 1748, aged 86, Beaucours retired with a pension of 3,000 livres and a gratuity of 600 livres. By 1749 he had overspent his allowances by 1,800 livres and was selling his furniture to subsist. He died in Montreal on 9 May 1750, and was buried two days later in the church of Notre-Dame. 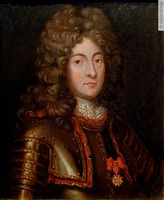 He was survived by his wife, Françoise, daughter of Charles Aubert* de La Chesnaye and Marie-Angélique Denys de La Ronde, and widow of Paul Le Moyne* de Maricourt. They had married in Quebec on 15 Nov. 1713 and had only one child, Georges-François. Beaucours’s greatest assets were undoubtedly his ability to work efficiently under pressure, and with others, and to satisfy a succession of colonial administrators. His fortifications were functional, and were therefore less expensive and more acceptable than the flamboyant projects of some other engineers from France. Moreover, his talent was not confined to military installations, for in addition to the Montreal prison and the intendant’s palace he designed a church for Sainte-Anne-de-Bellevue and added the finishing touches to the gates of Montreal’s church of Notre-Dame. He was a truly devoted servant of his king and country. AN, Col., B, 17–22, 27, 29, 34–36, 45, 48–50, 57, 64, 69, 71, 76, 78, 81; C11A, 6, 9–13, 15–17, 19, 24, 27–30, 32, 60; D2C, 47; E, 22; Marine, B2, 60, 169; Section Outre-Mer, Dépôt des fortifications des colonies, Am. sept., nos.3, 7, 9. ANQ, Greffe de Louis Chambalon, 1er, 24 sept. 1694; Greffe d’Hilaire Bernard de La Rivière, 10 juin 1714; Greffe de Florent de La Cetière, 13 nov. 1713. ANQ-M, Greffe de J.-C. Porlier, 12 sept. 1737, 9 juin 1742. ACAM, 525.101, 733–1, 733–2, 734–1, 734–2, 735-1, 742–1. “Correspondance échangée entre la cour de France et le gouverneur de Frontenac, pendant sa seconde administration (1689–1699),” APQ Rapport, 1928–29. “Correspondance de Vaudreuil,” APQ Rapport, 1938–39; 1939–40; 1947–48. Fauteux, Les chevaliers de Saint-Louis. McLennan, Louisbourg, I, 129–30. É.-Z. Massicotte, “Madame Boisberthelot de Beaucours,” BRH, XXI (1915), 239–42. Gérard Morisset, “Boisberthelot de Beaucours,” BRH, LIX (1953), 11–21. L.-A. Vigneras, “Documents inédits: l’Isle Royale en 1716,” RHAF, XIII (1959–60), 422–34. C. J. Russ, “DUBOIS BERTHELOT DE BEAUCOURS, JOSUÉ,” in Dictionary of Canadian Biography, vol. 3, University of Toronto/Université Laval, 2003–, accessed April 26, 2019, http://www.biographi.ca/en/bio/dubois_berthelot_de_beaucours_josue_3E.html.